Microsoft Stream keeps video content accessible by supporting captions and subtitles. If a video's Language field is set to a supported language, Stream will automatically generate captions using Automatic Speech Recognition technology. Captions are indexed and used by Microsoft Stream to power deep search, helping viewers watch exactly what they need. On the playback page, captions can be shown by the video player, and are also available in the transcript window. Currently, only English and Spanish are supported for autogenerated captions. Currently, only MP4 and WMV files are supported for automatic transcripts. You can't autogenerate captions if you have already uploaded a caption file. You can't upload a caption file if you have selected the Autogenerate a caption file option. Automatic captions take time to generate. It typically takes 1-2x the video's duration, so for example, for a one hour video, expect to wait roughly two hours to finish processing. Upload a video for which you want to enable autogenerated captions. If the video is already uploaded, go to the Edit video page. In the Details section, select a language from the drop-down box. On the Options tab, select to autogenerate a caption file. Microsoft Stream will automatically begin generating captions. If you need to fix any errors in the automatic caption, you can download the file from the Edit video page so you can edit and re-upload it. 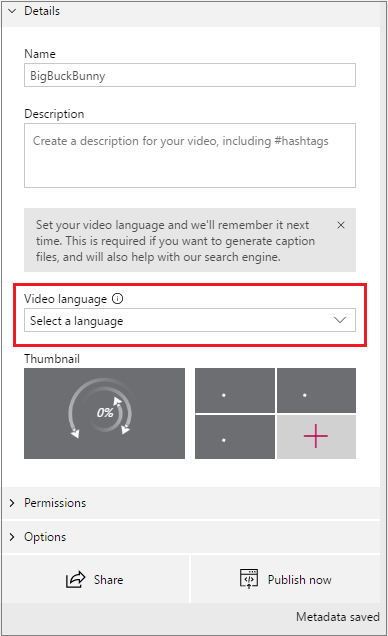 If you want to upload a caption file, follow the steps in Add subtitles and captions. You can't upload a caption file if you have selected Autogenerate a caption file. Uncheck this option if you want to upload a caption file. 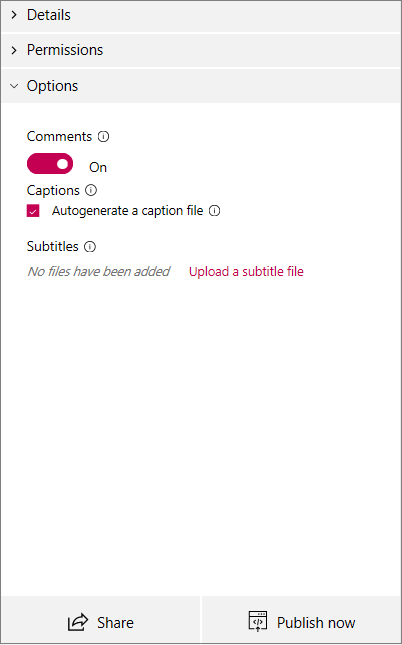 You can edit captions using the transcript window, or by downloading the files from the edit video page as described in Add subtitles and captions.